http://www.cashdrawer.com | Global cash management solution manufacturer debuts new branding at Retail’s Big Show to drive world-class customer experiences at the point of sale. As technology continues to evolve, our new branding enforces our commitment to innovation and the durable products we make. 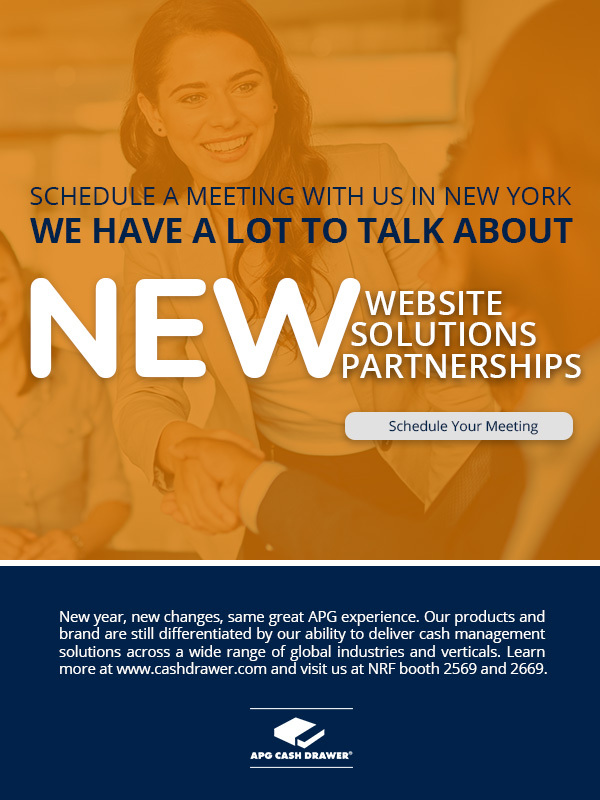 Minneapolis, Minnesota – January 14th, 2018 – APG Cash Drawer, a fast-growing global manufacturer of cash management solutions, announced today the release of a new branding initiative. The initiative includes a new website, http://www.cashdrawer.com and new trade show booth all being debuted at the NRF 2018 convention from January 14th – 16th, in New York, New York. A new streamlined navigation allows customer to find the resources they need quickly to make educated business decisions. The new website addresses POS pain points from reducing or eradicating cash shrinkage to creating technologies that grant POS peripherals secure connectivity to mobile POS platforms. Through a dynamic cash drawer configurator, users can build a wide range of solutions based on their local retail environment, number of transactions, cash management specifications and mobile integration requirements -- on any mobile device. APG’s value-added services and support pages aim to ultimately deliver customers seamless transactions and exceptional service at the point-of-sale. Retail payments are changing, yet there is still $1.5 trillion in cash in circulation. In fact, cash represents between 30 to 45% of all global transactions. APG has been designing and delivering cash management solutions with a variety of size, color, interface, and integration options for over 39 years. Whether you need a custom design, general application cash drawer or a product for a mobile shopping experience, APG has a solution. With our durable and dependable products installed, an APG cash drawer will provide years of smooth, trouble free service with virtually no downtime, no preventative maintenance, and no headaches. To learn more about our products, visit http://www.cashdrawer.com or call 763-571-5000. Follow us on Twitter at @apgcashdrawer and on Facebook.